Annabel is two months old already. Time is flying and blah blah blah, but I’m actually really glad to have the first two months done. I understand all her noises, I know how to make her smile, I understand how she ticks. I feel like I have my early anxiety much more in check (although there is still plenty). Annie is a very easy baby but those early growth spurts were brutal. My dad took a picture of Mike, Annie and me on Sunday. It’s nice to have a picture of the three of us where one of us isn’t freshly birthed or operated on. Yesterday morning it was time for Annie’s monthly photo session. When I look at last month’s picture, it really drives home how much she’s changed. She had her two month well-baby visit yesterday after her photo session. Dr. Looove checked Annie out and was very pleased with how she’s growing. Annabel now weighs nine pounds 14 ounces, is 22 inches long, and her head is 15 inches around. She’s in the 25-50th percentile for everything. Dr. Looove could have told me Annie was in the 100th percentile and I would have believed it. She seems sooooo big to me, all chubby with rolls and folds everywhere. And don’t get me started on the giant Spohr head. Annie did get her two month vaccines today, which also let us check on the status of her vocal chords. Verdict: working just fine. She did a lot of cuddling and sleeping the rest of the day. Her favorite place was in my shirt. It is so hard to be a baby. The amazing design for the Marching for Maddie gear is done thanks to my fantastic friend Colleen! There are items for adults, kids, and even pets! Anyone is welcome to get a shirt, even if you aren’t walking. ALL proceeds go to the March of Dimes. To order, go here. YAY! I love, love, love the family shot. You guys looks so beautiful. Wow, 2 months already, I can’t believe it. She is getting so big. Gotta love the chubby cheeks and beautiful baby fat rolls. She is gorgeous. Awesome family photo. Glad to hear that Annie’s monthly check-up went well. Two months already, wow. And I’ll definitely be purchasing a, “March For Maddie” shirt to do my part. west coast late bird right here!! annabel is completely adorable – i can’t believe how much she has grown already! i love the family picture. while i know that there should be 4 in that picture, maddie exists in all of you. my thoughts are with you, even on good days. .-= Jill´s last blog ..so, welcome to my little corner of the world. =-. Wow! Hard to believe its been 2 months! Cute pictures all around! It never dawns on me how giant my baby is until I see other babies around her age. Morgan was born Feb 13th weighing 9lbs 2oz and 22 inches. Hah! She looks just like her sister! I was wondering if you were planning on writing about how breastfeeding is going this time around, compared to breastfeeding (or pumping) for a preemie? Oh, and HOW do you get such shiny hair and rosy cheecks??!! Is it just the natural glow of a mom? I didn’t think this month’s picture could possibly top last month’s but MAN she just gets cuter. And I love the shirt design! I talked to my husband about joining but then realized we will be in Tokyo during the march. I will be sure to march through Tokyo with enthusiasm! I love how she’s sticking her tongue out to match her monster! Best of luck for the March. Your Little Annie has grown so much in 2 months and I really Love the design on the Marching for Maddie Gear. Its Absolutely Beautiful. .-= Desiree´s last blog ..Miss O & Her Award =-. What a beautiful family, Heather, Mike, and Annie!!! I love the Marching for Maddie design! She is so, so, precious…………………………..
What a great family photo and you are soooo right!!! She HAS CHANGED SO MUCH. I didn’t think i was physically possibile but with every growth spurt she gets even MORE beautiful! I guess the only question left to ask is…”So when does she get an agent”? wow, what a beautiful design1 Also – love those pics. made my day. I love that crazy tongue in her 2 month pic! Adorable! I so hope for you Heather, Mike and especially Annie that you have more moments of peace and joy. Without fear or doom thinking that probably is inevitable if you lost a baby. I do hope that the good times with Annie will make up a little bit (don’t know if that is a good saying) for the hurt and pain you felt when Maddie passed away. I do hope that there is a genuine place for joy and happiness, so that Annie gets her share of it. I have often wondered if babies coming after a sibling passed, if they ever are able to live without sort of a black cloud above them. I love the Marching for Maddie design: especially how the hands form to make an “M” !! She is so beautiful. She is really starting to look like here and not just baby Mike. That was a nice photo of the three of you. I am never in the pictures as I am always behind the camera! The t-shirt is really bee-u ti-ful! And so is Annabel. I bet it’s hard not to see how she resembles Madeline. That block thing is soo cool. I wish the internet was around when my kids were babies. I would have rocking photos!! she is super adorable..great family picture too! Love the t-shirt design!! Come see my Peanut Butter Egg recipe! You should make some!!! Opps..sorry for the typo! Here is the link for the Peanut Butter Eggs!! Everyone and everything on the post today is beautiful! Love how precious Annie looks…could just squeeze those sweet cheeks! Love how precious all three of you look. 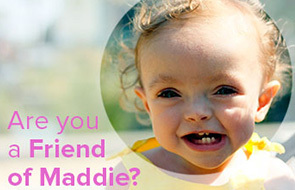 LOVE the new design for March for Maddie! BEAUTIFUL! .-= Christy´s last blog ..What to say? =-. The tongue sticking out made me giggle. You guys are just gorgeous, inside and out! I love all of the pictures, but the 2 month picture is just about the cutest thing I have *EVER* seen! What a cutie-patootie!! I can’t believe how much she changed. So cute. I the t-shirt design for Maddie. Your friend did an amazing job! What a fantastic family photo, you all look great. I love Annie’s pretty dress, she is so very beautiful, just like her big sister Maddie and her Mum. Annie’s two month photo with Maddie’s Monster and her very own Monster is adorable. And what special Marching for Maddie t-shirts. I just love that photo of Maddie, she looks radiant. How very special to have these special shirts to wear. Thinking of you, Mike, Maddie and Annie. Ms. Annie is gorgeous – actually, all of you look awesome!!! I LOVE the blocks on the motnhly photo shot. I am KICKING myself for not taking an official monthly picture of Cortlyn. Never occured to me!!! Sigh. Oh well, I have plenty of pictures from each month of her first year! I also LOVE the design for the March for Maddie shirts. I might just have to order one of those! That is a beautiful family picture! Although Maddie is not picured here, I see her everywhere in this photo — she’s in your eyes, your smiles, your hearts. Reading your blog has forever changed me. Oh, she’s beautiful. You guys are a gorgeous family. Wow that goes fast! Love the design, too. .-= Adventures In Babywearing´s last blog ..Do I need to separate you two? =-. the shot of her in your shirt is *nearly* as cute as her 2 month picture with the blocks. What an amazing baby!!! .-= JennK´s last blog ..Headed out to sea on the Failboat. =-. And I know what you mean–I never missed those early days/months either. A friend told me she cried as she packed up her son’s 0-3 month clothes once he outgrew them but I didn’t feel that way at all. I was glad to put those hard months behind me and excited about what lay ahead! Annabel just gets more and more intriguing with each passing day! How can it already be 2 months? HOW?! Annabel is adorable. And the photo of you all is beautiful. Oh. What beauties you all are! .-= Ms. Moon´s last blog ..I’m Sorry =-. The Marching for Maddie artwork is gorgeous! And so are you and Mike and Annabel. You all look great! Glad to hear Annie’s progressing so well. She’s a beautiful baby. That beautiful baby resting in your shirt is just too much. Looks like perfect contentment. Annie’s picture made me chuckle. Love the tongue sticking out, too cute. Shows how much her little personality is starting to blossom. Wow, she has changed a lot in 2 months! Still looking a lot like Mike, but now I am seeing a lot of Maddie in Annie! Good job, parents!! I’m waiting for an income tax return, then I will either donate to March for Maddie, or get a Tee shirt. What a beautiful picture and design around it. I believe Maddie is helping Annie to be an easy baby. Been a follower for a long time now. Just wanted to let you know I am the proud owner of a Friends of Maddie baseballl style tee! I cannot wait to wear it!! Love from Kentucky! Aaaaw, look at that photo with her little tongue sticking out! Too cute! I love the March for Maddie design! .-= Lamb´s last blog ..5 Random Things That You Will (Hopefully!) Enjoy Reading =-. Annie is a lovebug! And the family photo is so cute. .-= Angie [A Whole Lot of Nothing]´s last blog ..Life or Death Decision IN CARTOON! Cake v Pie =-. you guys make the cutest babies!!! I come everyday just to see her little face! Oh my! That little tongue! What a sweet girl. Oh, how I dreaded the growth spurts at the start. I can still feel the dread filling my heart when I think about them. .-= Sarah´s last blog ..If there were baby Olympics, =-. The photo of the three of you is gorgeous. And her 2 month pic is so stinkin’ cute!!! .-= amy2boys´s last blog ..How To Get Boys Interested In Cooking =-. I love that you spelled everything out in blocks for the “monthly” photo. So clever. Family shot is great but….that 2 month picture- Oh. My. Goodness! So great! Ohh Nellie had her 2 month yesterday too. She SCREAMED when they gave her her shots and I cried. It IS hard being a baby. .-= Natalie @ Hope Springs Eternal´s last blog ..If I Had My Way =-. She’s looking more and more like Maddie. Beautiful, my second niece. Can’t wait to meet her. .-= Aunt Becky´s last blog ..Never. There. =-. Happy 2 months old Annie! Congrats Daddy & Mommy Spohr! Annie looks so much like her big sister… just adorable! Love the tongue sticking out! Too cute! What a gorgeous family! What a great family picture! Annie is so cute! Wow! She is getting blonder! She is starting to look just like Maddie. The picture of the three of you is beautiful! Annie’s 2 month picture is priceless! It almost looks like either she is hamming it up for the camera or using that tongue as leverage to help her sit up…I am cracking up!! Too Cute!! .-= Michelle Pixie´s last blog ..Outta Here =-. You are amazing Heather. I don’t know how you do it. It’s so unfair. I too saw Dr. No Vowels throughout my pregnancy, each time waiting for hours while praying for good news from the Dr. with the bedside manner of a doorknob. (sorry Dr. T if you’re reading) Thank God I was blessed with a healthy (so far) child. But it would just kill me to sit there hoping and praying, and then turn on the news and hear all these stories about people who abuse or didn’t even want their children. It still pisses me off, and even more so when I think about you amd Maddie. I know I need to change my thoughts. I’m working on it God Bless your family. And that little Annabel? OMG. My ovaries go crazy every time I see her pic. Holy cuteness Batman. Oh those cheeks. Want to just eat them up. I adore the picture of the three of you. Happy two months to Annie. .-= Issa´s last blog ..A month is long enough, right? =-. Your family pic is beautiful! Buying a shirt for me and my daughter No puppies in our family, but we’d love to see Rigby in that adorable doggy gear. .-= Anne´s last blog ..Inspiration Part 2 =-. Heather and Mike, you guys make babies that are dangerous. Daaaangerouuus, I tell you. Everyone’s ovaries pretty much flip out over the SQUEE-so-adorabuls-ness of Maddie and Annie. And the Marching for Maddie shirt design? So amazing! The attention to detail, with the balloon and the hands… it’s fantastic. I have been so out of touch lately with personal projects. Stopped in to see how Annie was doing…. So, So gorgeous. Love the idea with her on the chair and the blocks, totally going to have to steal it girl! You look fab! .-= Pamela @ 2 Much Testosterone´s last blog ..Post It Note Tuesday – The Drive Home =-. Annie is growing so beautifully! I am ordering a t-shirt…and I am trying to win a local radio stations contest each morning…if I can win (God willing) I would have $100,000 to give to March of Dimes on behalf of Maddie. You all have touched my life and your story has changed me and help me realize the amazing charity that is March of Dimes. God Bless. Heather, Annie is just a sweet, precious little doll!!! So happy to see that she is doing so well! Also, I CANNOT WAIT TO GET ME SOME marching for Maddie Gear!!!!!! Beautiful design!!!! I LOVE that you have put Annie in purple with the Maddie Monster for each one of these. Can’t believe she is 2 months already! .-= Dawn´s last blog ..How do you choose your bracket? =-. I read your blog every day, I used to talk to you on twitter, but I don’t comment much. I do want to say that I wish I could walk this year. I walked last year in California, just moved to CO. Due to a very high risk pregnancy I am unable to walk, however, every chance I get I donate. My thought are with you and all those marching for Maddie… Hugs to you, your hubby and your beautiful babies. Oh my goodness, could she be ANY cuter in the 2 month picture?! I LOVE the tongue!! The family picture is great as well. And I love the March for Maddie image. It came out beautiful! .-= Stacey´s last blog ..March of Dimes!! =-. She is really very beautiful. OMG I love the picture of her with her tongue sticking out!! SO CUTE! Makes you want to eat her right up. Happy two month monthaversary to Annabel! She is a beauty! LOVE the Marching for Maddie design! Beautiful! Oh wow, I just love the family photo of the three of you. Annie sure is getting big!!!!! Also, did you know that Annie shares a birthday with another very special little baby girl? I love that you guys do the family pic! You guys look wonderful and I think it’s important to note that despite sleep deprivation you look gorgeous! Your hair looks beautiful and you guys all look so happy you could burst. Your baby is a doll! Congratulations on every happy day! .-= Sirena´s last blog ..Mini Aubergine Fries with Tahini Dipping Sauce =-. I got them at Target! They are by Circo, only like $16!!! I can’t believe she is already two months old, man time flies sister!!! You look absolutely beautiful Heather. And I love Annabel’s tongue sticking out in the second photo– what an absolutely sweetie! OMG, the in-your-shirt photo is adorable!